A cultural melting pot of different sub-sects and ethnic groups, Assamese live a hybrid lifestyle with cross-assimilation of different concepts, beliefs and social norms dating back to over 2,000 years of recorded history. The very first cultural assimilation too place nearly 2,000 years ago with Austro-Asiatic and Tibetan-Burman people living in this region gifted with perennial rivers, thick forests and natural beauty. Many references are there in Mahabharata and common folklores pointing to the existence of a vibrant kingdom here even before the era of Jesus Christ. The naming of the rivers and spatial distribution of ethno-cultural groups support the theory of early assimilation of people. Later on, the western migrations from the Mediterranean, Irano-Scythians and Nordics along with mixed northern Indians -- the cultural mix already present in northern Indian states such as Magadha -- enriched the aboriginal civilisation and which under stronger politico-economic systems came under the heavy influence of Sanskrit and Hinduism. In such a most hybrid culture having source elements it is difficult to trace their exact roots and they are a matter of research. But it can said with certainty that in each element of Assamese culture -- language, traditional crafts, performing arts, festivities and beliefs -- either local elements or their Hinduised or Sanskritised versions are always present. 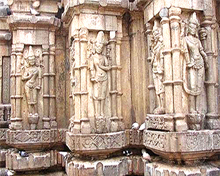 It is generally accepted that during the first millennium AD consisting of 300 years of the great dynasties of Pragjyotisha-Kamrupa (Varman empire); 200 years under the Mlechchha dynasty and 200 years under the Pala dynasty, the original Assamese culture had evolved and took a definite shape. A new chapter of cultural synthesis began to unfold itself after the Tai-Shans entered the region in 1228 CE under the leadership of Sukaphaa forming one of the strongest politico-economic systems under the Ahom dynasty which lasted for the next 600 years in Assam. The original Tai-Shans assimilated the local culture, adopted the language on one hand and on their part, also influenced the mainstream people with the elements of their own lifestyle. Likewise, the Sutiya kingdom (eastern Assam), the Koch kingdom (western Assam) and the medieval Kachari and Jaintia kingdoms (southern Assam) offered the platforms for assimilation at varying degree of intensity with different forms of cultural mix. A renewed Hinduisation of local forms, beliefs and lifestyle took place during the 15th century Vaishnav movement led by Srimanta Sankardeva (Xonkordeu) and his disciples. This socio-religious movement was first supported by the Koch and later on by the Ahom kingdoms. 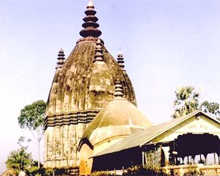 A number of social institutions such as namghar and sattra that were part of Vaishnav monasteries became part of Assamese life contributing much to their language, literature and fine arts. The attempts to introduce alien cultural practices by the Vaishnav movement and modify the life of common man had, however, faced resistance in some pockets of the region. Brajavali, a language created by introducing words from other Indian languages, failed to get patronage from the locals, but it left its lingering impact on the Assamese language. New rules and code of conduct made changes in people's food habits and their cultural life. Later on, this lifestyle further alienated a number of ethno-cultural and political groups. During strong politico-economic systems of powerful dynasties, there were intense cultural assimilation that led to the growth of Assamese culture. Whereas under less powerful dynasties, localised attributes were created with spatial differentiation. Modern Assamese culture is greatly influenced by the various events those took place under the British rule and in the post-British era. The language was standardised by American Missionaries based on the prominent dialect spoken in the Sibsagar district, the nerve centre of the Ahom dynasty. While a renewed Sanskritisation of Assamese language and grammar created a new wave of literature which was further influenced by the western and north Indian cultural elements, thus giving rise to new genres of performing arts. Due to increasing standardisation in the 19-20th century, the localised forms in different districts and among the remaining source-cultures with the less-assimilated ethno-cultural groups have seen greater alienation. However, the hybrid Assamese culture is one of the richest and is still under development stages. Various elements are used to graphically depict beliefs, feelings, emotions pride and identity of Assamese people. Symbolism is an ancient cultural practice in Assam and plays an important role even in the present context. Tamulpan, xorai and gamosa are three main symbolic elements. Tamulpan (the areca nut and betel leaves) or guapan (gua from kwa) are offered as devotion, respect and friendship. It is an ancient tradition with roots in the Austro-Asiatic culture. Xorai, a traditional symbol of Assam, is a manufactured bell-metal object used as a container-medium while performing respectful offerings. It is an offering tray with a stand at the bottom. 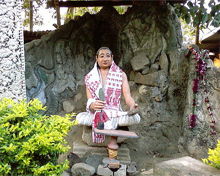 The gamosa is an article of great significance for the Assamese. Literally translated, it means 'something to wipe the body with' (Ga=body, mosa=to wipe); interpreting the word "gamosa" as the body-wiping towel is misleading. It is generally a white rectangular piece of cloth with primarily a red border on three sides and red woven motifs on the fourth (in addition to red, other colours are also used). Though Gamosa is used daily to wipe the body after bath (an act of purification), the object has multi-purpose role as farmers use it as waistcloth (tongali) or a loincloth (suriya). A Bihu dancer wraps it around the head with a fluffy knot. Guests are welcomed with the offering of a gamosa and tamul (betel nut). It is used to cover the altar at the prayer hall or cover the scriptures. An object of reverence is never placed on the bare ground, but always on a gamosa. One can therefore, very well say, that the gamosa symbolises the life and culture of Assam. Cane and bamboo craft, bell metal, brass craft, silk and cotton weaving, toy and mask making, pottery and terracotta work, wood craft, jewellery making and musical instruments making have been the traditional occupation for thousands of years. Assam also excelled in making boats, traditional guns and gunpowder, colours and paints, articles of lac, traditional building materials and utilities from iron. 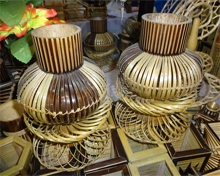 Cane and bamboo craft provide the most commonly used utilities in daily life from household furniture to weaving accessories and musical instruments to construction materials. 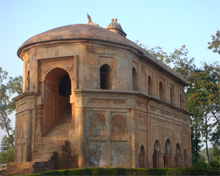 Hajo and Sarthebari (Xorthebaary) are the important centres of bell-metal and brass crafts. Assam is known for its prestigious silk item called muga, this natural golden silk is exclusive only to this region. While Sualkuchi is the traditional hub for silk industry, all rural households in Brahmaputra Valley produce silk garments with fine embroidery works. The ethno-cultural groups in Assam make different types of cotton garments with unique embroidery designs and a range of colour combinations. The people are good at making toys and masks which are mostly concentrated at Vaishnav monasteries, pottery and terracotta in western Assam; and wood craft and jewellery across many places. In fact, Assam is known for traditional fabrics like dhoti, gamosa, jaapi, khadi, mekhela, chador, riha, tongali and uroni. 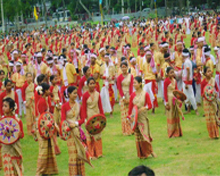 Bihu is the most celebrated festival in Assam. It is a series of three important festivals to mark the seasons and is a significant pointer to a farmer's life in a calendar year. All communities take part in Bihus as they are non-religious in character. Three Bihus are celebrated in all -- rongali to usher in spring and the beginning of the sowing season; kongali, the barren bihu when the fields are lush with crops but the barns are empty; and the bhogali, the Thanksgiving Day when the crops are harvested and the barns are full. Rongali, kongali and bhogali bihus are also known as bohag, kati and magh bihus respectively. The day before the each bihu is known as uruka. There are unique features of each bihu. The first day of rongali bihu is called Goru bihu (the bihu of the cows). On this day the cows are taken to the nearby rivers or ponds to be bathed with special care. Traditionally, cows are respected as sacred animals by the people of Assam. Bihu songs and dance are associated to rongali bihu. Baisagu (or Bwisagu) is a seasonal festival of the Bodos of Assam and it denotes the start of the New Year. Baisagu is a Boro word that originated from the word "Baisa" which means year or age, and "Agu" means start. Ali-Ai-Ligang is the spring festival of the Mising people of Assam. The name of the festival is derived from three terms -- Ali (root and seed), Ai (fruit) and Ligang (to sow). Bohuwa dance is performed during the festival of Sonowal Kacharis in Assam. Home to a many ethnic groups and diverse cultures, Assam is rich in folk music which in turn has influenced the growth of a modern idiom. Some popular artistes who blend traditional and modern music are Jyoti Prasad Agarwala, Bishnuprasad Rabha, Bhupen Hazarika, Nirmalendu and Utpalendu Choudhury, Pratima Barua Pandey, Luit Konwar Rudra Baruah, Parvati Prasad Baruva, Jayanta Hazarika, Khagen Mahanta. The new generation singers are Zubeen Garg, Angaraag Mahanta, Kalpana Patowary, Joi Barua, Jitul Sonowal and Manoj Borah. The capital Guwahati has become the country's hub for rock music along with Shillong. Of late, a number of rock bands were formed to showcase their talents. 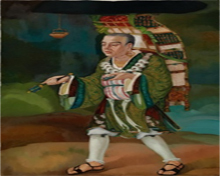 The Chinese traveller Xuanzang (7th century CE) in his account mentions the ancient practices of kings. Particularly, he writes about Bhaskaravarma of Kamarupa gifting several items to King Harshavardhana of Magadha fame including paintings and painted objects like Assamese silk. Many of the manuscripts from the middle ages are fine examples of traditional paintings. The most famous of them is Hastividyarnava (a treatise on elephants), the Chitra Bhagawata and in the Gita Govinda. Traditional Assamese paintings have been influenced by the motifs and designs in the medieval works such as the Chitra Bhagawata. The Guwahati Art College is a prominent institution owned by the government in the field of fine arts. Several art-societies and NGO initiatives exist across the state that create platforms for exhibiting a range of paintings of artistes drawn from diverse backgrounds. The Guwahati Artists Guild is a front-runner organisation in the field of arts. Moreover, the Department of Fine Arts in Assam University, Silchar, a central government organisation, focuses on the art and craft of northeast India with special reference to Assam.